At any moment, our future lies in front of us, infinite paths waiting to be taken. 10 books … and counting! This month, I published my tenth book: Death at Glacier Lake, my first mystery. But publishing my tenth book in the year 2017 wasn’t a given. Then, one day, realizing I didn’t know how many days I had left, I decided my “one day” had arrived. Not knowing what would come of it, and giving myself full permission to fail, I started writing. Ten books later, I know that decision was one of the best decisions I’ve ever made. My world has changed, my life has expanded, my courage and gratitude grow every day. Here are ten lessons I’ve learned along the way. 1. You have to start. It’s obvious, right? But at the same time, you have to do it. My thought that “one day I would like to write a book” wasn’t enough. I had to actually do it. Elizabeth Gilbert tells the story of a friend of hers who runs marathons. Apparently (I’m not a runner), at the end of the race, everyone is listed by their finish times. Beyond that, there’s the DNF list — Did Not Finish. But Elizabeth’s friend told her that in her mind there’s another list: DNS, Did Not Start. Even if you come in “last,” just by being in the race you’re ahead of millions of people who Did Not Start. You can’t finish the marathon without running the first mile, or the tenth, or the twentieth. You can’t get to the thousandth step without taking the first. Some people don’t want to start because they’re worried they won’t “get it right” the first time. I’ll save you the suspense: you won’t get it right the first time. Of if you do, it’s a fluke. Beginner’s luck. If there’s something you want to do, something you want to be, you will fall a lot along the way. But you can’t improve if you don’t start. My eighth and ninth books (the Balky Point Adventures series, Middle Grade/Young Adult sci-fi adventure) and my tenth (Death at Glacier Lake)are my absolute favorites of all the books I’ve written. But could I have written them if I hadn’t written all the others? Definitely not. Everything that came before informed and shaped those books. If you don’t start, you can’t get to where you want to go. 2. You don’t have to know the exact path to or location of your dream. You just have to start walking. I said above that some people are afraid to start because they’re worried they won’t get it right. But what about the legions of us who don’t start because we don’t know where we want to go? That’s okay. You don’t have to know where you’re going. Just start moving. I often imagine a giant, open, empty field, with infinite paths branching off of it. If you don’t know where you want to go, what you want of your life, you might end up standing there in the field, paralyzed by indecision. But where does that get you? If you see a path that looks interesting, try it. Follow your curiosity. You can always change paths. You can always backtrack. Any movement at all will tell you something. It might tell you you’re on the right path, or it might tell you that it’s not for you, after all. Along the way you’ll pick up other wisdom and information about what you do or don’t want in life. Don’t let yourself be stuck by the idea you have to know your final destination, or that you have to know what your dream is before you can start moving. You don’t. You just need to get moving. Is writing books what I’ll be doing for the rest of my life? I have no idea. But it’s what I’m doing right now, and it’s taking me places I never imagined, and that alone is worth the journey. 3. Success isn’t what you think it is. Many of us have in the back of our minds — or even in the front of our minds — a very shallow idea of success: money, fame, prestige, power. That’s success, right? Well, by some measures, sure. But not by the measures that really count. Sure, those things are nice (I’ve heard), but what I’ve come to believe is that true “success” is simply synonymous with “trying.” Making the effort. Being in the game. Letting yourself be vulnerable and trusting yourself enough to know that when you fall, you will be able to get back up. At its most basic, purest level, that’s success. I’ve heard it said that success isn’t the absence of failure; it’s the result of failing enough. The most successful people will often tell you they’re successful because they failed more than their competitors ever dared to. The kind of “success” most people aim for is really just a moment. The moment you win the game (but there’s another game ahead that you might lose). The moment your book is on the bestseller list (but the next one could flop). The moment you have everything you ever dreamed of (but you could lose it all). But those moments are fleeting and ephemeral. The true satisfaction of life — the true success — comes from making the effort, being a participant in your own life, every day. Success comes from showing up. In your life, and in the lives of the people and causes that matter to you. From living your values and priorities, not just talking about them. I have not yet made any bestseller lists, but I’m showing up for my life; I’ve reached a point where I know, every day, I’m building and living a life that I love. To me, that’s success. 4. Failure isn’t what you think it is. The converse of the above is true, as well: if success is “trying,” then failure is nothing more than “not trying.” That’s it. “Failure” doesn’t mean “making mistakes”; it’s not “falling short.” Aside from mistakes made due to negligence or lack of attention, everything else builds toward success. If you’re making the effort, and learning as you go, you’re not failing. I remind myself of this over and over: it’s okay if I make mistakes. It’s okay if I fall. What’s not okay is not trying. Along with this comes the idea of embracing rejection. If you can learn to see rejection as proof that you’re trying, and aim to be rejected as much as possible, you can almost guarantee you’ll start to succeed more. Get comfortable — even cozy — with making mistakes. Think of mistakes as priceless data points on the way to your goals. As I said above, when I made the decision to try writing a book, I gave myself permission to “fail.” Giving myself that permission, whether I realized it or not at the time, was one of the most powerful things I could have done. It meant I was committing to the process, regardless of outcome. Living that idea has been key to getting where I am now. Always, I have permission to “fail.” What I don’t give myself permission for is not trying, not getting in the game. If you’re afraid to try something because you’re afraid you might fail, ask yourself: what’s the worst that could happen? And is it worse than letting your fears keep you from ever getting anywhere? 5. You have to step outside of your comfort zone. Striving for “success” means committing to “failure,” which means stepping outside of our comfort zones over and over and over. And over. We know — and the older we get, the more we know — that unused muscles atrophy. The same is true of life. An unused life shrinks. Inertia sets in and we become too comfortable with being comfortable, and next thing we know, we aren’t fully living. If you aren’t stretching yourself and trying new things, your life will shrink. You’ll stop trusting your ability to handle new situations. You’ll start to believe that all you have is all you are capable of having. You’ll give in to the myth that you can’t have a fuller life. Stepping outside your comfort zone — and “failing” — allows your confidence to grow. You learn that mistakes aren’t fatal, and that you can survive a fall. You’ll learn to trust your ability to get through difficult situations — because it’s not about trusting that bad things won’t happen; it’s about trusting that you are strong enough to handle those bad things when they do. This knowledge gives you the courage to try the next new thing, and the next, which leads to falling more and more, getting bruised and battered more, but also leads to a bigger, richer, more satisfying life. Among the things that terrify me are book readings and school visits. I make myself do them not because I’m a masochist, but because I know that I actually, generally, end up doing a pretty good job, and as they say, what doesn’t kill you makes you stronger. Every time I stand up before a group of people, talk about my books, and don’t die, I’m reminded that I can do things that scare me and still survive. This gives me confidence to try more things that scare me. Instead of shrinking, my life is growing. 6. Your path is not anyone else’s path. It’s tempting, once someone has “succeeded,” for them to want to tell the rest of us how they got there. And it’s tempting, for those of us hoping for our own “success,” to listen with rapt attention and try to recreate their route. But the fact is, no one person’s path is going to be the same as another’s. What worked for someone else may not work for you. You have to learn to trust in your own path. Trust the pitfalls, trust the detours, trust that every step in some direction is getting you closer to your goals. I’ve seen people who research what all the most successful people do, in an aim to find the path to success. Their idea is that if ninety percent of successful people do something, then doing that same thing will help them be successful, too. There’s certainly merit to the idea, but it doesn’t account for the outliers. Some of us may be the successful outliers. You may be an outlier. What works for ninety percent of people still doesn’t work for that last ten percent. You have to figure out what works for you, not for everyone else. Don’t aim to be the next someone else. Be the first and best you. In 2013, I went a little crazy with the books. First, I published the third book in the Wishing Rock series, The Tides of Wishing Rock, in March. Then, since those books are “novels with recipes,” I decided to compile all the recipes into another book, From the Wishing Rock Kitchens: Recipes from the Series. THEN (well, actually, the planning began beforehand but the work came after the cookbook), I decided to launch a new series of travelogues, Pam on the Map. I wanted to go on a trip specifically designed as the flagship book of the series, Pam on the Map: Iceland, which meant a trip to that icy island in July/August. 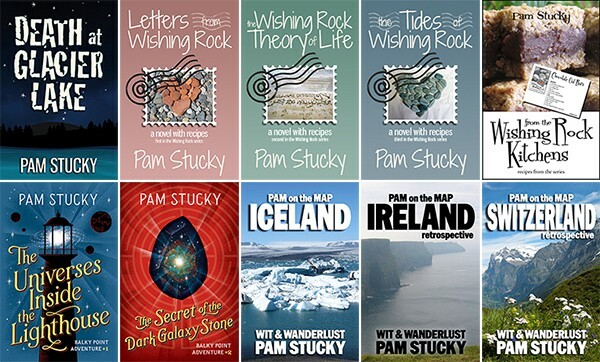 At the same time, I wanted to launch the series with more than one book, so I reached back to writing I’d done on past trips and compiled two mini-books, the Pam on the Map retrospective books on Ireland and Switzerland. Between the trip in July/August and October, I wrote and assembled all three books, and then I launched the series in October. I was reading an article the other day that pointed to a study that says “only 16 percent of respondents reported getting creative insight while at work. Ideas generally came while the person was at home, in transportation, or during recreational activity.” If we want to be creative, we have to rest. Pushing ourselves too hard may be tempting in that it feels necessary for “success,” but see the definition of success in #3, above. If we are pushing only for the end goal, we’re missing the point. Remember to rest. 8. You can’t do it all at once. But when writing a book, there is simply no way you’re going to finish in a day, or even a week. Sure, there are the NaNoWriMo people who finish a book in a month, but I’ll tell you, the vast majority of them come away exhausted. (See #7, above.) No, writing is a marathon, and you have to learn to simply accept the day’s accomplishments and begin again the next day. The idea of this expectation of slow but steady progress has carried over into other areas of my life, much to my benefit. Right now, I’m writing this article with an actual hourglass filled with sand measuring my time. I’m writing for an hour, and then when the hour is up, I’ll take a break. The article will still be waiting for me, and I can finish it later. Getting some of it done is better than putting it off forever because I think I have to finish it in one fell swoop. Do a bit at a time, and you’ll get there. There is no such thing as “perfect” when it comes to human beings (or, probably, when it comes to anything at all). Even if something is perfect to one person, it may be worthless to another. To be human is to be imperfect, and the idea of reworking something until it’s perfect is just an excuse for never putting your work out there. Think of it this way: you will learn more from writing fifteen books than you will learn from writing one book and spending fifteen years perfecting it. Replace “writing books” with anything else and it still holds true. Do the best you can right now, put your work out into the world, and start again. Learn from your challenges and your mistakes, and the next time, you’ll do better. Related to this is the idea that you have to start before you’re ready. If you wait until you know exactly how to do something before you do it, you will never start. How could you? Part of knowing how to do it comes from doing it — and making mistakes, and learning, and trying again. Waiting until you believe you can do something perfectly before trying, or waiting for your work to be perfect before sharing it with anyone else: these are all excuses and forms of procrastination. When I started this post, it was “9 Things I’ve Learned About Life from Writing 9 Books.” But I got too caught up in wanting it to be perfect, so now it’s “10 Things.” If I kept waiting until I knew for sure it was perfect, I’d never publish it. The books I’m publishing now are better than my first books (though I still love my first books!). Isn’t that the way it should be? I would be disappointed in myself if my last book wasn’t far better than my first. As I said in #1, you can’t get to the thousandth step without taking the first. In my case, I can’t get to book ten without writing books one through nine. It is better to be in the game imperfectly than not be in it at all. Any or all of us could die tomorrow. Live (and create) today. 10. It’s hard, but it’s worth it. If living any dream were easy, everyone would do it. It’s not. There have been countless times when I wanted to give up, settle back into a life that would be easier but which wouldn’t, for me, be as fulfilling. When I started writing Death at Glacier Lake, I’d never written a mystery before and had no idea how to do so. Despite endless research and reading, it was the most excruciating challenge, in terms of writing, I’ve ever faced. Time and time again I wanted to give up and just leave the project unfinished. But I’ve learned enough about myself that I knew I needed to finish; that leaving it half done would leave me feeling unsettled. I finished, and the end result is, frankly, one of my favorite books yet. And now I’m thinking of writing a mystery series! Everything worth doing, everything worth having, everything worth being, takes work. So many of the best things in life are also the most challenging. But pushing through those challenges is worth it, every time. I think we tend to have this idea that everyone around us knows more than we do, is smarter, is more creative, is more capable. But the fact is, everyone has strengths, and everyone has weaknesses. Including you. I can almost guarantee this: the people who seem to know everything, don’t. Those who seem to have everything figured out, haven’t. (In fact, if they tell you they have, run. They’re lying, whether they know it or not.) People who have achieved greatly don’t know everything, and are certainly not without their own fears and insecurities. Rather, they’ve learned to sit with the discomfort, work alongside (not through) the fear, and cope with uncertainty. They have cultivated resilience and mental strength and courage, which is something we can all build. So, how do you get comfortable with uncertainty? You learn to trust that whatever comes your way, you can handle it. How do you learn that trust? You practice stepping outside your comfort zone, as often as possible. At the end of our days, we will regret the things we didn’t do, not the things we did. I started writing because I didn’t want to die with a big “What if?” “What if I tried writing a book?” I tried, and I know the answer: it changed my life, for the better. And, I’m just beginning. Stay tuned for “20 Things I Learned From Writing 20 Books.” Keep learning! Originally published at pamstucky.com on March 26, 2017.